A talk given by Father Mateo, SS.CC., apostle of the Sacred Heart of Jesus and founder of the Work of the Enthronement, to a group of Eucharistic Sentinels making a Holy Hour at the Benedictine Sanctuary of Perpetual Adoration in Tucson, Arizona. Dear Friends - You are the friends of the King, so we are friends. Are you really zealous? Are you really apostles of the Sacred Heart in the Blessed Sacrament? Yes, I am preaching love; I am preaching the Lover, Jesus - a love self - forgetting, a love spreading, a love conquering. You must be apostles! You love him; you must be apostles, the ones to set fire to other hearts, to other baptized Catholics, that they may love the Master as you love Him. How many Catholics there are who have not grasped the duty of being apostles, the duty of gratitude! How many there are who are interested only in themselves, in their own spiritual welfare, and care nothing for that of others. No, it is our POSITIVE DUTY, OUR OBLIGATION, TO BRING OTHERS TO THE MASTER, to give Him not only our own souls but the souls of others. Be grateful and be generous in giving of the treasure which Our Lord has entrusted to your care, lavishing these treasures on souls, on poor, starving souls. It is sad that so few love Jesus. Therefore, make him better known, better loved. In His name I ask you: be apostles, in gratitude, in charity. We preach charity toward the poor and unfortunate people. That is beautiful, splendid, and it must be done; and yet, what is material charity when compared to a soul? I refer to the conquering of even one soul, for there is nothing greater than that - to conquer souls redeemed by Our Lord, for whom He shed His Precious Blood. That is true gratitude, true charity. You must love each other, your neighbors; then give them Jesus, give them Jesus! Give Jesus to those straying far from Him; a duty of charity concerning souls, a duty of gratitude toward Jesus, your Benefactor, who has chosen you as His friends, who has overwhelmed you with graces; then give what you have received. But that is not sufficient. Fervent Sentinels, trusting in your generosity, I go farther. Do you know what I am preaching everywhere? I am preaching: Pay the ransom of souls with the Chalice, with the CHALICE. The greatest means of converting souls is one more Mass, one more Mass during the week, and, with sacrifice, two or three more Masses; if possible, daily Mass, to pay for the eternal salvation of souls so dear to you. That is the great thing - the Chalice filled with the Precious Blood. You will never see souls go astray if you pay the ransom, hearing one more Mass, two, three, four, and, if possible, daily Mass. with sacrifice; then you are apostles, paying the ransom for the Sacred Heart. I remember long years ago, a lady - she had her own unconverted mother, and that old lady was dying. Nothing, nothing to be done. Her daughter, a wonderful Catholic, said to her: "Mother, you are baptized; you are supposed to be a Catholic." But the mother would not listen. "Nonsense! Allow me to die as I have lived. I do not need God; 1 am 78 years old!" The daughter came to me, asking what should be done. I said to her: "Pay the ransom; you are a Catholic. go to Mass, daily Mass." She was wonderfully faithful. She was not at all healthy, the church was at a distance, yet she never missed one Mass. It seemed fruitless. She said to her mother one day: "Mother, please, you are dying. Shall I not call a priest?" "No! No!" Then the daughter brought a picture of the Sacred Heart, which she held up for her mother to see. "Here, Mother, is the King of Love. Please, Mother, let Him come to you in Holy Communion. I have prayed and gone to Mass daily, in order that you may not die without making your peace with Jesus who has loved you so much. 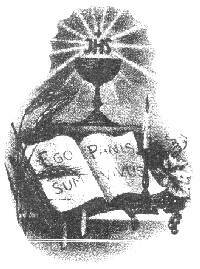 The Chalice has been offered every day for you, that your soul may be washed in the Precious Blood." So the daughter pleaded, until finally the mother turned to her and said: "I do not know how, but I have changed completely. A priest - oh, get me a priest at once!" And the mother died praising the Sacred Heart of Jesus. Then the husband, a man living with hate in his heart toward God - an actual apostle of Satan. He also asked for a priest, for he was sick, very sick. He asked for Father Mateo. I heard his confession four times, and he received Holy Communion as often. He called in fifteen or twenty of his former friends, also living in hate, and said to them: "Kneel down and adore Christ the King, the King of Love. That is the only thing worth while." He died praising the Sacred Heart. Then the third one in the same family, gone astray - the youngest brother, twenty-five years old, also returned to the Sacraments. And why? The Mass, daily Mass, the Chalice, the greatest power of redemption. How often have I heard young ladies say to me: "Father, we are making novena after novena for certain conversions but to no avail." Do you know what I reply? I do not blame that; that is all right but instead of annoying the saints with novena after novena why do you not make a novena of Masses? THAT IS THE GREAT NOVENA. And all the saints will applaud you for they realize the greatness of Holy Mass. I do not blame your novenas to the saints but I say transform your novenas into something divine, omnipotent - the Chalice - one more Mass - two, three or four more Masses - if possible daily Mass. You are asking for a miracle; I approve, But I tell you that you must pay the ransom for the conversions you make. You have a right to ask for such miracles. Do you know what a conversion is? It is the resurrection of a soul. It is far greater to see the resurrection of a soul than the resurrection of a corpse. Oh one more Mass! Please - one more Mass! Pay the ransom with the Chalice. One more Mass! If you have anyone at home sick, or dying, oh, pay the ransom with the Chalice - one more Mass! May I relate to you something personal, with real emotion? I am the son of a Protestant. My father was an Anglican. One of my uncles was a missionary in India, the other a Canon in Westminster Abbey in London for thirty years. Yet I have seen my father, 58 years old, kneeling for his first confession and first Communion, weeping out of joy, the great Anglican, over powered by grace. Who converted him? The grace of God. But who was the instrument? A great preacher? Yes - that preacher was my mother. How did she succeed? Speaking generally, you know that husbands do not like sermons at home. Then how did she convert my father? She never missed Mass, her daily Mass, except when sick and dying, and even then the priest came to give her Holy Communion. When I left home for school in the morning, she was already back from church - and we were eleven children. She knew her first duty was to the home, to attend to her family; and yet in spite of that she found time to go every morning to Holy Mass and to receive Holy Communion. She paid the ransom. Our Lord was obliged to grant her the favor, for He is justice as well as truth. I venerate my mother. She died in 1935, when I was preaching in Japan. She is saying, as I am saying, that it is the Chalice, the Chalice, the CHALICE! A saintly soul said one day to Our Lord who appeared to her: "O Lord, what could I offer to Thee, for Thy glory, for my sanctification, for the salvation of many, many souls?" And Our Lord replied: "For My Father, for yourself and for souls, give Me one more Mass!" Where there is a will there is a way; where there is love, there is a way. When you love Him, come! come! come! With sacrifice prove your love, by giving Him, one, two, three Masses during the week, if possible daily Mass. If you make the effort, you will be blessed a thousand times and you will praise Him one day. I remember preaching in Scotland, when it was very cold. The pastor asked me to speak to a large number of little ones, six, seven, eight and nine years old, about to make their first Communion. I said to them: "Tell Mama that I am preaching the reign of the Sacred Heart - that you are going to become missionaries." After I had finished speaking to the children, one little girl came to me and said: "My daddy never goes to church; he never goes to church. I am going to say to Mama what you have said, and I am never going to miss one Mass." You see, I had preached the Sacred Heart, and asked them to help me save souls with one more Mass. The child told her mother she was going to attend daily Mass for her father. The mother thought it was too cold, but the child insisted she must save her father's soul. So the mother at length consented to allow her to attend daily Mass. Three months later I met this child, and she said to me: "Father, do you remember what I told you about my daddy not going to church? Well, I have never missed one Mass since then. It has been cold and I am often sleepy, for it is early. And do you know what I say to Jesus when I have Him here (in her heart)? I tell Him I am going to Mass and Communion every morning. It is for my daddy, for my daddy. I am paying the ransom. I am taking his place here every morning, so that You may save his soul, here at the altar rail, my loving Jesus." Wonderful! When the precious moment of Consecration has arrived, imagine yourself on Calvary, standing beneath the Cross with Mary, and, united with her sentiments, offer to the Eternal Father the Precious Blood and Wounds of Jesus, for the conversion of sinners and unbelievers and the poor souls in purgatory. And now, united with Jesus and Mary, look at your crucifix and make your offering by saying: Eternal Father. I offer Thee the Wounds of our Lord Jesus Christ to heal those of our souls. My Jesus, pardon and mercy through the merits of Thy Sacred Wounds. Renew this offering for every wound of Jesus. You will also have time to see Him in spirit, in pain and suffering, in the first, second, and third fall under the heavy weight of the Cross. Do not forget the adorable Face of Jesus, the seat of Al1 wisdom, crowned for us with thorns. God promised a great reward for those who honor His holy Face. In this offering, we are offering heaven to heaven. This is not all; we are following the Master, the Good Shepherd and the good Samaritan, to heal the wounds of our Savior who has loved us so much. Let us trust Jesus in our temporal needs and especially in our spiritual needs. When saying in the "Our Father," give us this day our daily bread (the Holy Eucharist), let us be mindful to plead for our neighbor, the lukewarm, and ourselves. Never miss Mass through your own fault. Some times you cannot attend; but make the effort never to miss one Mass and Communion, in spite of difficulties. You will bless me when dying, if you do this. May God grant you the grace to attend Mass daily, and to receive daily Communion with the intention of saving souls from hell, and thereby glorifying God in heaven for all eternity. There is no greater love.